With the recent sale of Innova to Proctor and Gamble, pawrents are naturally concerned about the future quality of the high-protein Evo food that so many cancer Tripawds eat. 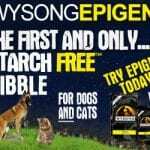 If you’re searching around for a new high-protein kibble for your Tripawd, you may want to consider Wysong’s new Epigen dog food. According to Wysong, starches are traditionally used to extrude and bind the ingredients in conventional dry kibble. ut to form kibble, “only about 30% of the formula can be meat in order for the product to form properly,” Wysong says. The rest of the formula is mostly starch, which as many cancer pawrents know, is a carbohydrate that converts to sugar in the body. Sugar feeds cancer cells and dogs fighting cancer should avoid it as much as pawsible. With Epigen, Wysong is using a new technology that requires no starch in the kibble extrusion process. Instead, protein chains derived from vegetable and meat sources are used to form the kibble. Because of this technology, Wysong says, Epigen has at least 60 percent real meat. Is Starch-Free Better than Grain-Free for Cancer Dogs? All kibble contains at least one form of carbohydrates and starches (rice, oats, barley, corn, other grains, potato, peas, tapioca, etc.) 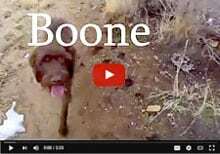 in order to decrease costs and bind the kibble formula together. Wysong says that grain free diet manufacturers have only removed high quality grains, such as rice, in favor of other starch ingredients, such as potato and peas, which aren’t any more nutritious. The underlying issue, says Wysong, remains the same: carnivores are not designed to consume a constant diet of starch. Instead of starches, Epigen uses vegetable proteins, including high biological value corn protein, to bind the ingredients and provide nutritional value. Although the use of corn seems contradictory to pet health, Wysong says that starch is the real enemy and true danger to your dog’s health. While some dogs may have true allergies to corn, Wyson believes that the main reason for allergies and food sensitivities in pets is the exclusive feeding of one diet meal after meal. The best way to fight cancer, avoid allergies and stay healthy, Wysong says, is not to remove all grains from the diet, but to feed a variety of foods and rotate them regularly. Even Dr. Dressler, author of the Dog Cancer Survival Guide, says that it’s OK to include brown rice in your cancer warrior’s diet mix in order to stretch your budget. 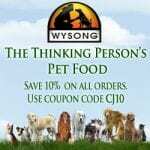 Wysong has a good downloadable paper about starches versus grains on the Epigen website and another good one called “The Pet Food Ingredient Game,” which discusses the myth of “complete and balanced” pet foods. 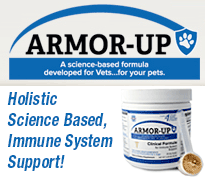 We encourage you to learn more about dog food nutrition and Epigen. Be aware that because of the extremely high protein ingredients in Epigen, this food may not be suitable for dogs with kidney issues. Also, remember that no dry dog food is truly “complete and balanced” enough to be the only source of food for a dog. For optimum health, rotate your Tripawd’s meals with a variety of foods, from high protein kibble like Epigen and their highly rated Aus Jus canned meals, to fresh foods for snacking, like green beans!. Learn more about Wysong’ suggestions for optimal canine health, by downloading their free Optimal Health Chart here. BTW, Dr. Dressler also says it’s OK to feed oatmeal as well as brown rice. Heh heh Gina, that’s funny! We do love the Wysong company. 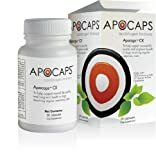 Did you know they also make human supplements? Thanks for adding the tip about oatmeal, Tracy, I forgot about that one! Yes..I did know they make human supplements. You gotta hand it to Dr. Wysong…he sure goes against the “grain”(ha!) at times…I have his book too. I wish they’d make a premix you can add meat to…like Honest Kitchen, Sojo’s, etc. I’m just not into feeding kibble and canned foods. I didn’t know about their human supplements until recently. I think when we go back on the road we’re going to order some. Oooh I’ve been wanting to get his book. Wanna write a review for the blog? Oh, egads…been years since I read it!!!! I’d have to reread it! 😉 I could send it to you – then you could read it and do a review! Wanna borrow it? Oh sure! Be hoppy to! I’ll PM you our current address. Thanks! Bellona has been on Epigen for a few days now and LOVES it. Previously she was Eating Canidae Lamb & Rice. I work for a pet supply distributor so I can get it cheaper than retail, but it’s still expensive for an 87 lb dog. On a side note: We’ll continue to feed Canidae to Caesar.